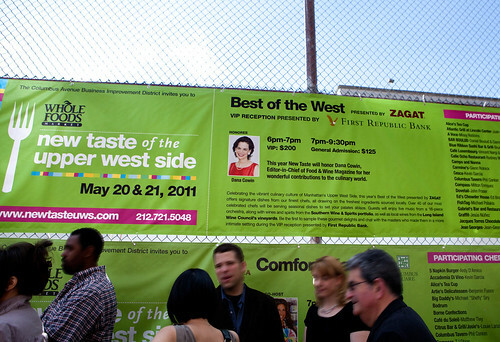 This year’s New Taste of the Upper West Side’s Best of the West featured 38 fine dining restaurants and bakeries of the area and Dana Cowin, Editor-in-Chief of Food & Wine magazine as the honoree. 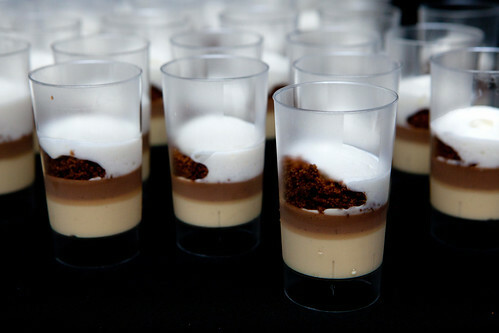 Arriving at the VIP Hour, it’s easier to move around and mingle with chefs and other partygoers. It was also nice to be sheltered within the block-long tent on Columbus Avenue, as it rained after the first hour or so of the party. 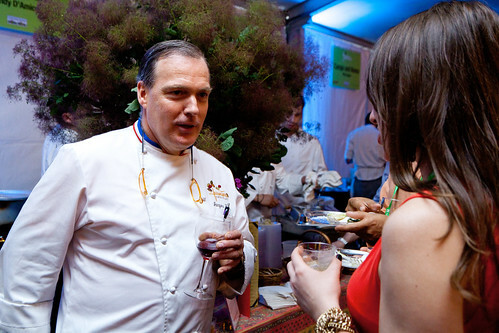 It was fun to speak to Chef Jacques Torres, who is an avid fisher. 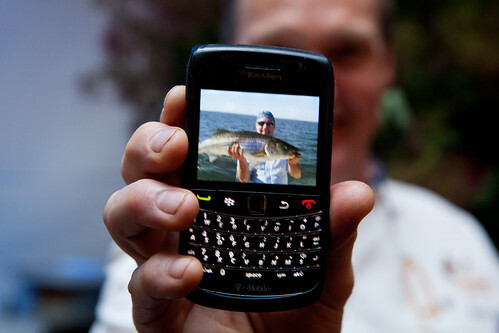 He even took out his Blackberry and proudly showed his biggest catch so far – a 25-pound striped bass. 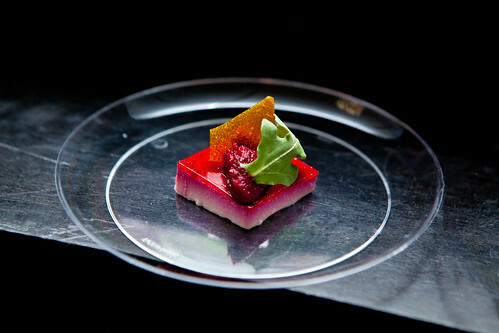 Picholine‘s goat cheese panna cotta with beet textures was a beautiful and thought-provoking dish. The goat cheese flavor was a good backdrop flavor and the beets were really the star of the dish. It’s not too sweet that it still comes across as a savory dish. 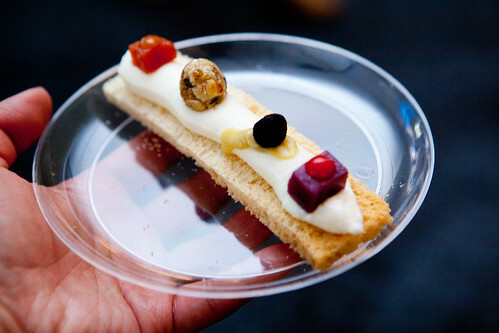 Chef Jesus Nuñez of Graffit served Four tastes of goat cheese. A cheese toast dotted with a row of pairings, starting with a red wine gelee (complex) and ending with quince and honey (simple and familiar pairing). 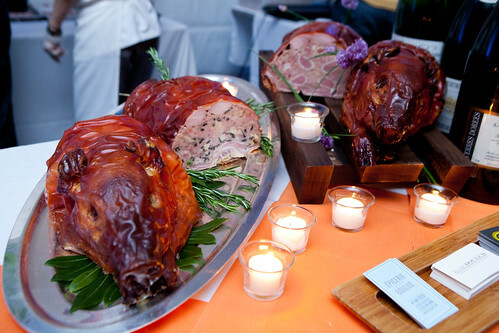 Chef Damian Sansonetti of Bar Boulud swooned my pork-lovin’ heart, by serving Three Suckling Pigs “Porchetta”. 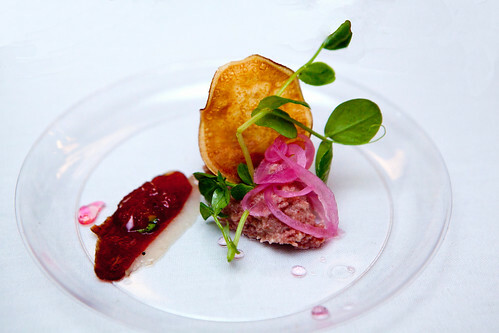 It’s charcuterie at it’s finest. 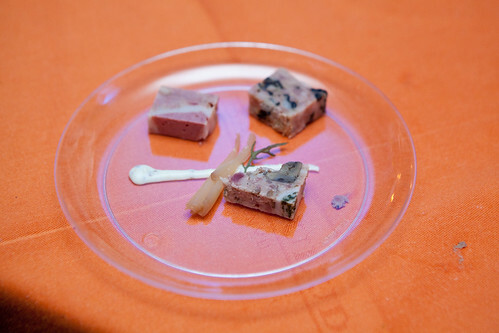 Hudson Valley Foie Gras Farms served Rillet of Hudson Valley Foie Gras, Duck Proscuitto of Mostarda di Crimona. A delicious duck-centric plate that would make my cardiologist freak out if I ate several more servings. Jean-Georges served seared a very Japanese-inspired dish of seared sushi rice topped with aioli, smoked salmon and micro red shiso leaves. 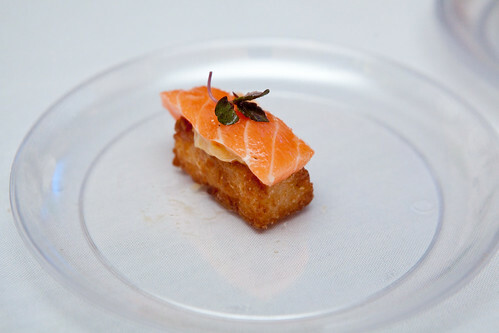 It was a harmonious mix of warm, room temperature; crunchy and soft textures; as well as the sweetness of the salmon and the refreshing touch from the shiso. 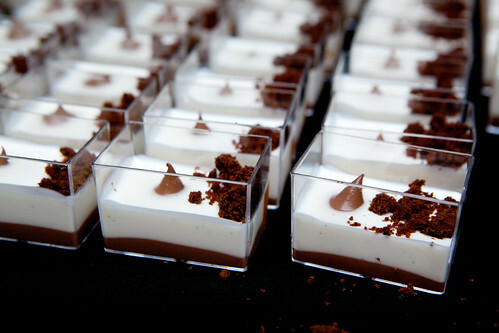 Of course, I always need dessert to finish my meal. 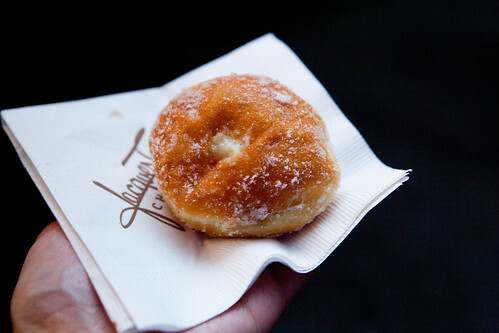 My favorite three were from Jacques Torres’ bomboloni filled with vanilla pastry cream. It’s greaseless, feathery light dough and the vanilla pastry cream was sublime; the other two were creations from Ai Fiori‘s pastry chef Robert Truitt: the “Cappuccino Ghiacciato”, a lovely verrine of Valrhona chocolates topped with almond foam and a panna cotta that has a dark chocolate ganache core, apricot gelee and coffee granita. The latter two desserts make me consider going to Ai Fiori a bit more of a priority on my list of restaurants to eat. 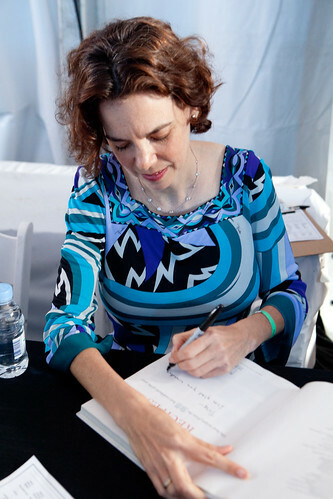 Sometime during the second hour or so, Dana Cowin started to autograph books for attendees. 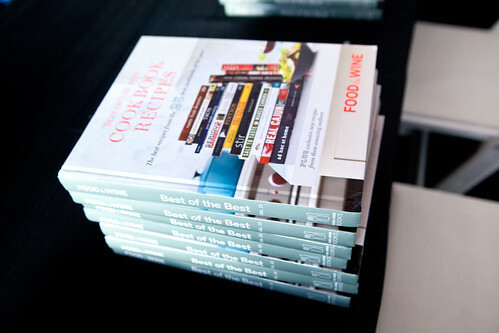 It was an honor to meet Ms. Cowin as I love the magazines they print every month from the photos to the recipes. To those of you who wonder, is it worth that price tag? 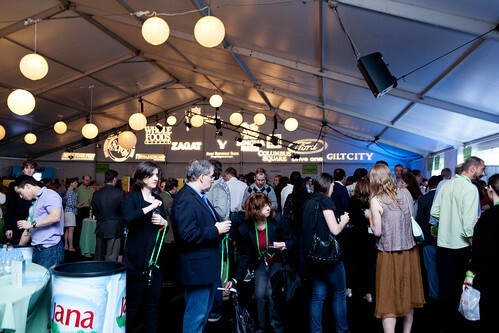 I think yes, especially with the number of beverage vendors and variety of restaurants you can eat and drink your way through and its certainly on the classier end than other public food events. Of course, there were a few restaurants that finished early (as in 2 hours or so) because of its popularity with their dishes and you have to get there before it runs out of food.